You could almost see a baffled ‘WTF’ come across Eric Lombrozo’s face as he watched Gavin Andresen at CoinDesk’s Consensus 2016 conference. The man many people saw as the leader of the bitcoin community, or at least a kind of elder statesman, Andresen had just affirmed that he was standing behind Craig Wright’s claim that he was the cryptocurrency’s pseudonymous creator Satoshi Nakamoto. “It was a very bizarre moment,” Lombrozo, a Bitcoin Core developer since 2011 recalls. Lombrozo was not alone in that thinking. Andresen’s announcement onstage was a bombshell that caused a commotion for the rest of the event with both community members and reporters, most of whom had dreamt about uncovering that story for years. For Andresen – a man so well-liked, so looked-up to, yet so resistant to his leadership role within the bitcoin community – to make this rash assumption in public with everyone watching, seemed curious, if not embarrassing. As interviews reveal, however, it had deeper effects. What might seem like a harmless comment to some would do much to shake perceptions of Andresen among the very group of people he was supposedly leading. Just like the cryptocurrency itself, Andresen found himself in the spotlight nearly overnight, at least as it relates to any mainstream celebrity status. Graduating from Princeton with a computer science degree in 1988, he developed software for a number of companies before landing on a full-time role working on bitcoin alongside Satoshi Nakamoto in December 2010. Before this, though, he focused his career on 3D graphics and virtual reality modeling. From there, he dedicated his life to advancing public perception of bitcoin (at various points explaining it to the CIA and giving out by today’s value thousands of dollars in bitcoin via a public website). Andresen proved effective in enlisting other developers in working on the open-source software protocol. Then, around early October 2013, the price per bitcoin started rising pretty quickly, from $133 on the first to more than $1,200 two months later. There were glowing articles about his involvement, and as the industry grew from a swelling of investment in 2013 and 2014, he took positions as an advisor at key companies and a full-time position at the Bitcoin Foundation, the nascent industry’s once-prominent advocacy group. Andresen as the face – at least the unmasked face – of bitcoin became a minor celebrity. And everyone wanted to know the backstory. The persistent narrative that came from these inquiries was that, when Satoshi Nakamoto left the project, he happily handed the work over to Andresen. But Lombrozo, and other developers, think the tale is a bit embellished. Sure, he said, Andresen deserves credit for bringing cryptographers and developers together to build the project, but Satoshi didn’t really hand over the reins, he/she/they/it simply disappeared, they say. The more romantic version of the story gave Andresen even more clout. As more developers began working on the code and more venture-backed startups began building applications for the protocol emerged, Andresen still had a significant amount of influence over the path of the world’s first decentralized cryptocurrency. Yet, as a decentralized, open-source project, many developers who joined bitcoin perhaps weren’t predisposed to such notions of hierarchy. As it may be, one of the most misunderstood aspects of bitcoin is what a massive technical project it is, one that involves collaboration from a large group of interested parties and near-constant mundane tasks like code de-bugging. And as an outgrowth of the scaling debate, bitcoin has even come to encompass differing developer groups, working on competing implementations of the code. Further, Bitcoin Unlimited, a rival group of developers, is able to work on wholly different fixes that aim to make changes to the network. As the lead maintainer for the project, Andresen played a key role in facilitating this work in bitcoin’s early days. Today, development is overseen by Wladimir van der Laan (employed by MIT), but startups Chaincode Labs is the largest single supporter of Bitcoin Core development. MIT employs two full-time developers, while Blockstream supports Pieter Wuille and Greg Maxwell. Some members of Core don’t have any relationship to a startup or company, others do. Yet, they’re all united by an active, and public, mailing list that serves as the basis for formal discussion on project ideas. It’s perhaps a clash of cultures then that came to a head the day Andresen took the stage at the Marriott Marquis in New York and vouched for Wright. Not a week later, Andresen’s ability to make changes to code had been revoked. Behind the scenes, Andresen and the other developers had also started butting heads about other things. Wladimir van der Laan, Bitcoin Core’s lead developer and maintainer, told CoinDesk, that even before Andresen turned the position over to him, he had been doing most of the “maintainer tasks”. His statements, and those of others, paint a portrait of someone increasingly divorced from the day-to-day efforts that kept the project up and running 24/7. “Not only was [Andresen] not writing code, he wasn’t discussing on the developer IRC nor on GitHub, nor reviewing code,” Van der Laan said. And this is where things really went sour. How Andresen saw his influence within the Core developer community was evident during a 2015 CoinScrum event in London, where Mike Hearn, a former Core contributor, and Andresen spoke about the continuing block size contention. “A lot of people are pushing me to be more of a dictator,” Andresen said, as Hearn took a swig of a beer and pointed at himself. There was discussion then from an audience member about calling his role something other than “dictator”, such as “traffic cop” or “decision maker”. Andresen suggested “ice breaker”. This authoritarian statement seemed strange to participants in a community building a decentralized protocol that’s always touted its imperviousness to control by any one person, group of people or state. According to Lombrozo, this event was only a month before Andresen started pushing for bigger blocks on his blog. And shortly after, when Corallo saw the posts, he brought it to the attention of the Core mailing list. After Corallo’s post, Pieter Wuille, a Core developer since 2011 and co-founder of Blockstream, penned a response in support of increasing the block size, but wary about using Andresen’s proposed method and hard forks. According to Lombrozo, Andresen was talking to bitcoin companies such as Coinbase, BitPay, Blockchain and Xapo, selling them a solution to the block size limitation that hadn’t gone through any peer review. Yet, to those participating in bitcoin development, there were channels of communication where such fixes were supposed to be brought up. Bryan Bishop, a Core developer since 2014, said the Core team had sent Andresen multiple requests “asking him to voluntarily step down from (mis)representing Bitcoin Core to the wider community”. Although, it also kind of was. Because Andresen’s plan for increasing the block size was met with resistance by the other Bitcoin Core developers. According to Lombrozo, that’s because there were technical concerns with his proposal, but Andresen was not willing to listen. Instead, Andresen went back to those companies he had spoken with and told them the fix was simple but Core wasn’t interested in helping. “The problem was that he was misrepresenting himself as having some sort of special privilege in bitcoin development – but really anybody can show up and propose anything,” Bishop said. Andresen created this “expectation that a quick fix was there and that’s been a huge point of frustration,” Lombrozo said. According to Lombrozo, no one knew how pervasive Andresen’s involvement was with advising startups and at least he thought most bitcoin companies had executives following Core communication channels for updates. The blog Bishop mentioned was Andresen’s own, where he sometimes conveniently skirted issues the Bitcoin Core mailing list was discussing. This, something most people would find aggravating, though, Bishop analyzed more pragmatically. Could money have been involved as some in the community have suggested? Andresen was getting paid by the Bitcoin Foundation and held advisory roles at startups. According to Lombrozo, though, some Core developers and the group’s supporters took unpopular stances that the block size should never be raised, but that wasn’t the pervasive sentiment. Core had trouble abating that idea, though, since Andresen who had been the frontman for the corporates and public for some time had already passed the torch to a much less public Van der Laan. Not to mention, Lombrozo went on, explaining the issues was difficult in that it required an in-depth knowledge of the protocol to understand the trade-offs. Plus, he said, the way some Core developers and its supporters reacted was less than ideal, many times brash, if not stooping to the level of personal attacks. Especially on the Core team’s communication channels, which didn’t scale well as the community expanded rapidly. So off Andresen went, joining forces with Hearn, who’s now a developer at bank-focused blockchain consortium, R3, to push an alternative implementation called Bitcoin XT. “That was the beginning of the politicization,” lamented Lombrozo. Bishop agrees, saying, the narrative that ‘Core doesn’t listen’ is easily discounted by the fact that anyone can send any of the Core developers an email at any time. Although, Lombrozo doesn’t think Andresen intended for that politicization to turn into the big mess that it has today (Lombrozo is still cordial with Andresen), there’s no doubt the issue is one of the biggest on the table for the now eight-year-old digital currency protocol. Olive branch or poisoned apple? While Andresen’s moves seem to have caused an unstoppable rift in the bitcoin community, some Core developers have reached out “to extend an olive branch”. Andresen, the developer said, is still friendly, but there’s an awkwardness now and many Core developers hold grudges because of the perception that he betrayed, if not completely sold out, the team. And everything seemed to implode that summer day on the stage at Consensus. According to folks in the bitcoin community, Wright invited Andresen, likely because Andresen had influence over the community, to London and convinced him he was Satoshi. For someone that’s spent years working on the bitcoin protocol, even interacting with a masked Satoshi during the early years, it seems odd that Andresen would fall for a scam. But Lombrozo suspects Andresen wasn’t complicit in any scam, but instead just got tricked. Van der Laan agrees, saying it was a “confidence scam” Andresen fell for. So where is he now? Since the Wright debacle, Andresen has been weirdly absent from bitcoin news. Although, in recent months he’s been tweeting more than usual about the block size debate. He’s also a co-signer of a still unreleased bitcoin scaling proposal being put forward by Digital Currency Group founder Barry Silbert. “He keeps repeating the ‘block size must increase’ line without being involved in any innovations that are happening,” said Van der Laan. In a follow-up email, Andresen did offer some confirmation on the blockchain-focused jobs he was last known to be working. He resigned, not only from the Bitcoin Foundation, but also MIT’s Digital Currency Initiative early in the year. Other than keeping an interested eye on the block size debate, though, Andresen was advising some cryptocurrency projects and involved in zcash to a certain extent, all while working on a stealth project. This stealth project people referenced might be the Random Sanity Project Andresen tweeted about at the beginning of this month. The project, perhaps owing to the continued debate about Andresen himself, was met with both praise and skepticism on Twitter and Reddit. Correction: An early version of this article stated that Blockstream was the largest supporter of core development. This has been revised. Disclosure: CoinDesk is a subsidiary of Digital Currency Group, which has an ownership stake in Blockstream. 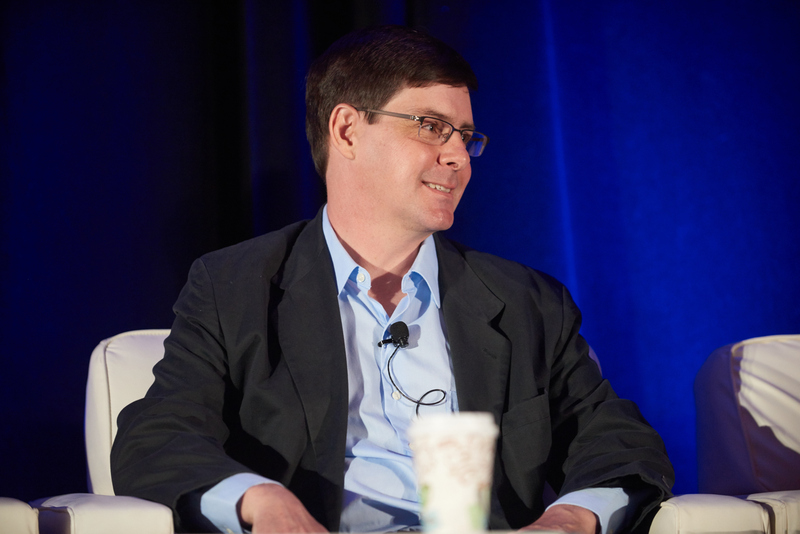 Gavin Andresen formerly served as an advisor to Digital Currency Group.